Crowdsourcing scientific data, also known as citizen science, is a new and rapidly growing field. The MDI Biological Laboratory in Bar Harbor, Maine, has developed Anecdata.org, an innovative online platform for citizen science projects to collect, manage, and share environmental data. Anecdata currently hosts 48 projects from organizations around the United States and abroad, with new projects emerging every year. Anecdata provides features that help both project managers and participants collect actionable data and interpret what the data mean, so that effective environmental improvements can be achieved. These features include self-designed datasheets, photo uploading and archiving, and data visualization through graphing and mapping. New features are being developed to meet emerging project needs, including video upload, predictive modeling, and community-building communications tools. Understanding, predicting, and managing the effects of climate change and other human impacts on the environment are critical challenges at local, state, regional, national, and global scales. To meet these challenges, researchers as well as municipal, state, and federal governments, nongovernmental organizations (NGOs), community groups, and individuals responsible for conserving and managing natural resources need access to large amounts of high-quality environmental data to inform decision making. There is a long history of citizens participating in the collection of environmental data that has informed researchers and policymakers at all levels (Miller-Rushing, Primack, and Bonney 2012). Through an examination of 134 case studies from three project sources, Newman et al. (2017) demonstrated that citizen science projects leveraging the power of place lead to more decision-making outcomes than those that do not. In projects designed to inform decisions, citizen science can help expand the data-gathering scientific workforce, while improving public understanding of and engagement with science (Bonney et al. 2016). 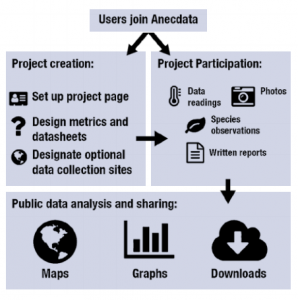 Anecdata is one of a number of online tools available to citizens interested in creating and managing their own environmental research projects or contributing to existing projects created by scientists or other citizens. Anecdata was born of a crowdsourcing need at the Community Lab, a citizen science– research and –education program of the MDI Biological Laboratory. The Community Lab is a research space where citizens can bring questions or contribute to ongoing investigations about the world around them. It is also a concept of citizen engagement in science and how it can be leveraged to effect change in communities. Most of our research and activities have a local focus on environmental health, especially as it relates to surface water and drinking water quality in Hancock County, Maine, and surrounding areas. In addition, the Community Lab provides outreach and education to schools and community groups, helping spread the word about the relationship between the environment and human health. Anecdata has become an integral tool in all the outreach and education programs at the Community Lab. Its unique feature set makes it ideal for use by project managers and citizen scientists interested in leveraging the power of place to inform decision making as described by Newman et al. (2017). One research focus of the Community Lab has been on the restoration ecology of eelgrass, a subtidal marine plant that serves as a nursery for juvenile fish and invertebrates, improves water quality by absorbing excess nutrients from the water column, and acts as a carbon sink in temperate areas around the world. We have accomplished most of our restoration work over the last decade by recruiting, training, and working with citizen scientists of many ages and from many different backgrounds. Despite early success with restoration, eelgrass loss continued in some areas. In 2013, there was a complete collapse of eelgrass throughout upper Frenchman Bay. Only rhizomes were left behind in the barren mud. 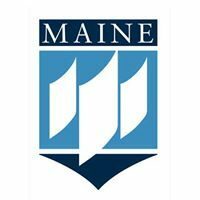 We recognized that we needed to understand this event on a broader scale and decided to crowdsource information from citizens in all areas of Maine. We wanted to know if eelgrass was lost everywhere or just in our study area in upper Frenchman Bay. We explored a variety of citizen science websites freely available on the internet and capable of managing environmental data, but each had limitations. In particular, there were no websites at the time that could capture presence/absence data. To have a data portal with this feature, we created a website with a single project called Eelgrass in Maine (Bailey et al. 2013). To recruit citizen scientists, collect these types of data, and better understand the loss of eelgrass in Maine, the site was made publicly available on the internet in the summer of 2013. We learned from the incoming data that eelgrass loss appeared to be restricted to upper bay areas. Both Casco Bay and Frenchman Bay suffered similar losses. This led us to develop a regional consortium of eelgrass researchers who meet every other year to discuss the status of eelgrass in the region and the actions and approaches we are taking to protect and restore eelgrass habitat. From this experience, we recognized that it would be valuable to expand the site to include other ongoing citizen science projects at the Community Lab. These include community-based environmental stewardship projects such as swim beach monitoring, coastal watershed surveys, phytoplankton monitoring, clam flat surveys, and cruise ship monitoring. Since many of our projects were initiated based on informal observations (a probable outbreak of swimming illness on a local beach, poor clam harvests, possible discharge from a cruise ship), we decided to call the expanded citizen science website Anecdata.org. We are currently transitioning all project datasets from our Access database to Anecdata, which will become the repository of all of our project data. This will enable new and existing stakeholders to have immediate access to historic and emerging information. Interested people will be able to download and use our data to inform policy or effect change in their communities. Teachers and students can use data to practice analysis skills and provide an impetus and model for development of similar projects. Data users may decide to become data contributors to our existing projects or establish new projects to achieve their own community goals. A natural extension of our effort to crowdsource information and make it publicly available was to open up the project site to the world. We recognized a need for an easy-to-operate site like Anecdata.org that anyone could use for any type of citizen science project. We promoted the use of the site to project partners and others at local, state, and national meetings. The site has grown to include many different types of citizen science projects from different regions of the country and beyond. Anecdata’s feature set continues to fill gaps in the current ecosystem of citizen science websites. In this article, we provide an overview of the applications of Anecdata, describe its feature sets, and share some examples of groups that are successfully using the site to accomplish environmental goals in their communities. We also describe how Anecdata.org is closing the citizen science data loop by helping users of the site to progress from data input to data visualization and data sharing. This progression is yielding tremendous gains in some communities where knowledge is leading to community action and community action is resulting in positive change and measurable improvements in local environments. Teachers and students have joined the ranks of citizen scientists in recent years. We engage teachers and students as citizen scientists, and in that capacity, they contribute data to existing projects. Others organizations have created projects specifically for implementation in schools. Over the last decade, the Community Lab has led environmental education programs related to eelgrass research and restoration for students from across Maine. 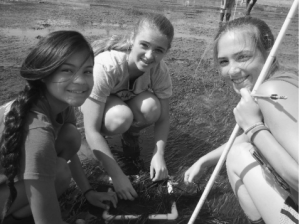 In 2009, we instituted a hands-on, inquiry-based environmental program in five middle schools on Mt. Desert Island, Maine, called Seagrasses in Classes, which was funded with an EPA Environmental Education (EE) Grant (NE-961063); in 2011, we expanded the program to support teacher interns and teacher-student teams from inland schools, with a second EPA EE grant (NE-96152801). From these early efforts at teacher-student engagement, the Community Lab has established ongoing relationships that continue to bring individual students and school groups to the Community Lab to contribute to environmental projects. Some middle school students who participated in Seagrasses in Classes became particularly engaged in classroom activities and expressed interest in contributing to our eelgrass restoration efforts, so we offered additional programs to expand their opportunities to explore the natural world. We developed a weeklong summer Young Environmental Leaders program to engage these students in ongoing environmental projects at the Community Lab. Seventy-eight students participated in the summer Young Environmental Leaders program between 2010 and 2014. Many of these middle school students returned in subsequent years as high school students to volunteer at the Community Lab, continuing to contribute to ongoing environmental projects and joining the effort to transition projects to Anecdata.org. • Introducing students to environmental content and concepts in school-based projects can lead to long-term commitment to environmental stewardship for some students, if opportunities exist for student engagement. • When comparing pre- and post-program surveys of middle school students involved in environmental stewardship projects outside of school, we found an increase in knowledge, skills, and confidence of students to engage others and take action. • We did not find an increase in middle school student interest in pursuing environmental coursework or careers, possibly because they were unaware of future options or because middle school students are not looking that far ahead. • The model of teacher-student research teams provides added support for engagement of high school students as citizen scientists. • When comparing pre- and post-program surveys of high school students involved in teacherstudent research teams, we found an increase in knowledge, skills, and confidence, but also interest in pursuing environmental coursework or careers. This may in part be due to the readiness of high school students to consider future options. Other student groups have contributed data to Community Lab projects on Anecdata.org. Students working with the Center for Community Inclusion and Disabilities Studies (CCIDS) as part of the Sustainable Ecological Aquaculture Network (SEANET) at the University of Maine collected green crab data during the summer of 2016 and learned to use Anecdata to manage and share their data. They met with parents and staff from CCIDS on Saturday mornings to conduct census work. • Students significantly improved their capacity to work in teams. • When comparing pre- and post-program surveys, students gained new knowledge of the effects green crabs on coastal ecosystems. • Anecdata made it easy for these students to connect with the project. Community Lab staff use eelgrass density and invasive green crab census data from students and teacher-student research teams to generate technical reports that are shared at the annual meeting of the Frenchman Bay Partners, a local consortium of more than 100 individuals and groups, with a mission of maintaining a healthy bay. The student data, being publicly available on Anecdata.org, are accessible by any group interested in comparing Frenchman Bay data with data from their own local bay. Schoodic Institute at Acadia National Park initiated the Acadia Learning Snowpack Project in 2013. In 2015, Education and Research Project Manager Hannah Webber added the project to Anecdata.org and uploaded historic project data; after that, teachers and students from K–12 schools in Maine started entering data into the site. The research question being investigated was, “How does the nature of snowpack and timing of snowmelt differ in the different climate divisions of the state of Maine?” There are a number of reasons why it is important to track snowpack. Meltwater from snow provides communities with drinking water; low snowpack can result in aquifers that do not sufficiently replenish in the spring. Furthermore, rapidly melting snow can cause flooding. Snowpack can also influence local economies, as some Maine communities depend on winter sports such as skiing and snowmobiling to support seasonal incomes. Finally, snowpack can lead to physical and chemical changes in environments that are essential to maintenance of healthy ecosystems. The landing page on Anecdata.org for the Acadia Learning Snowpack Project provides links to learn more about the project and its partners. The data were collected by students across all climate zones and include the onset of snowpack, snowpack depths throughout the winter, new snow amounts, and snow melt. In all, 17 project contributors made 1,252 reports; however, 40 teachers and 929 high school and middle school students from southern to northern Maine were involved in the program. Contributors uploaded 34 photos of snow at measurement stations. • Starting with a small group of teachers in the pilot year is an excellent way to understand the way school parameters and science need to dovetail. Starting with a pilot group creates a committed core of teachers. • Respecting the confines of the school setting is critical, and revising protocols to meet scientific rigor while recognizing those confines is essential. • Engaging students in real-world citizen science projects has the greatest impact when they can see that others are using their data. • Providing opportunities for personal interaction and space to develop relationships between teachers and researchers is important for success of citizen science projects. The project produced data regarding snow depth and duration from teacher-managed sites that characterized a range of land cover and land-use types, aspects, and elevations in different regions of the state. The data allowed for modeling and inferences at the scale of small watersheds. Student research projects revealed statewide differences in snowpack in project years with dramatically different snowfall totals. Within a school, students identified thaw events and linkages between snow depths and the type of forest canopy cover. Currently, the University of Maine and one partner school are following up on these results and extending scientific knowledge about the importance of winter processes. The project catalyzed interest in the issue of winter biogeochemistry and ecology, with two funded research projects resulting from these pilot studies. The project wrapped up officially in 2016; since then, teachers have continued to use the data on Anecdata.org in their classrooms, and the data are available for future reference by researchers or other interested individuals or organizations. In addition to schools, a number of community groups and NGOs have used Anecdata.org to initiate citizen science projects. Mass Audubon and Massachusetts Division of Fisheries and Wildlife initiated the Eastern Meadowlark Survey in 2017. This project aims to collect presence/ absence data obtained during repeated visits to randomly selected sites throughout the state of Massachusetts. Participants take responsibility for surveying specific points, then visit each of these points on three dates between May 15 and June 15. Visual and audio detections are used as indicators of meadowlark presence. While at the designated field site, participants also recorded information about Bobolinks and Grasshopper Sparrows. In addition to bird presence/ absence, participants also recorded information on type of detection (sight or sound), primary habitat within 150 feet of the observation site, and height of grass in the observation site. In the first year of the project, 52 contributors made 540 reports and uploaded 52 photos of habitat and birds, making a significant contribution to Mass Audubon’s understanding of needs for conservation initiatives. Anecdata project manager, Jon Atwood, director of bird conservation at Mass Audubon, reported back to project participants that Eastern Meadowlarks were present at 7 percent of the sites visited (Figure 1). Meadowlarks were the most seldom-encountered bird among the three grassland specialists monitored. The basic data that citizens contributed will be used to build a more a compelling case for conservation action. Mass Audubon will study meadowlark distribution in coming years and has invited citizen scientists to re-engage. Washington Sea Grant initiated the Washington King Tides Project on Anecdata.org in 2014. Gulf of Maine Council launched an East Coast project in the same year. King tides are the highest high tides of the year. Shoreline inundation at these high tides can be a harbinger of things to come as sea level rises as a result of climate change. Participants in King Tides projects take photos to help document coastal flooding risks and help municipal officials, local planners, developers, and others visualize what may become the new tidal norm along the nation’s coastlines. Participants in the project switch on the GPS device in their phone or camera (if available) so that the latitude and longitude are included in the image’s metadata; take numerous images, including landmarks and infrastructure, to provide clues about water height; and return to the same spot later for a low tide comparison, if possible. Both the Washington and Gulf of Maine King Tides projects started in 2014. To date, 19 participants in the Washington King Tides Project have made 68 reports and uploaded 120 photos on Anecdata.org. Since 2014, 16 participants in the Gulf of Maine King Tides Project, have made 118 reports and uploaded 257 photos. Our goal is for all of the King Tides projects around the world to use Anecdata.org to archive photos and associated metadata. Cross-comparisons between projects might help with setting national and international infrastructure priorities for dealing with climate change–induced sea level rise. Several projects on Anecdata.org were created to archive historical data that otherwise would never be publicly available. Historic data, collected in journals, have been used recently to understand impacts of climate change on local communities of flora and fauna. One of the most noted uses of such historic data has been the study of Henry David Thoreau’s journal entries, which chronicled times of flowering of over 500 native plants between 1852 and 1858. Using these and other data, researchers determined that in Massachusetts, plants are flowering on average 10 days earlier today than they were in Thoreau’s time and that 27 percent of the species present then are missing today (Primack and Miller-Rushing 2012). Gale McCullough, a resident of Hancock, Maine, has been observing seals since the 1980s and created the Maine Harbor Seals projects on Anecdata.org to make sense of, and share, her many years of observations. Gale started observing resident seals at a low-tide ledge in Kennebunkport in southern Maine and at a hightide ledge in the Young’s Bay area of the Skillings River in Downeast Maine, with a focus on individual identification, life histories, and site loyalty. These data may help researchers and coastal managers understand changes in populations that may indicate changing environmental conditions. To date, Gale has contributed 328 reports and uploaded 24 photos, mostly of beautiful sketches of individual seals with their unique markings and handdrawn maps of their locations. She has more data and photographs of more recent sightings, which she is in the process of uploading. Gale is continuing to add her 30 years of observations into Anecdata.org. Because the archived data are publicly available on Anecdata.org for any researcher or policymaker to access, Gale’s work may help to inform marine policy in the future. The ultimate goal of many citizen science projects is to change something for the better. Many citizens contribute data to projects hoping to make a difference in the world. In medical fields, researchers refer to this translation of information into action as implementing a knowledge-to-action framework (reviewed by Field et al. 2014). This framework consists of two main components—knowledge creation and an action cycle—and has applications to citizen science efforts aimed at using crowdsourced information to effect change at all levels. South Carolina Aquarium is concerned about plastic pollution, its effect on humans, and its impact on marine life. Plastic bag pollution, in particular, has had a dramatic impact on sea turtles that nest along the Southeast coast. The South Carolina Aquarium’s Sea Turtle Care Center has documented all types of plastic items, including single-use plastic grocery bags, in the gastrointestinal tracts of various species of sea turtle. Of the 17 sea turtle patients admitted to the aquarium’s Sea Turtle Care Center after ingesting plastic trash, 10 had eaten sheet plastics consistent with plastic grocery or trash bags, which sea turtles can mistake for jellyfish. • recycle items in accordance with local regulations. To simplify the data-collection process and save time for the aquarium staff (who used to collect paper datasheets from event participants and enter data in spreadsheets themselves), we worked with Christi Hughes, the conservation and research specialist at the South Carolina Aquarium, to design a customized mobile phone app for the project. The app was launched in March 2017. Citizens take their mobile devices in the field and use the South Carolina Aquarium Citizen Science app to enter data directly into Anecdata.org. This eliminates delays between events, data analysis, and community action. To date, 63 contributors have made 334 reports to the Litter-Free Digital Journal project and uploaded 359 compelling photos. South Carolina Aquarium staff used the data analysis feature on Anecdata.org to present a persuasive case to the Folly Beach City Council that the use of single-use plastic bags, balloons, and Styrofoam plates, cups, and containers should be prohibited on the beach. In October 2016, the councilors voted unanimously to ban these plastics on the local beach. The new ordinance came on the heels of a ban on the distribution of single-use plastic bags to customers by Folly Beach businesses, which the South Carolina Aquarium also supported. Buoyed by these successes, South Carolina Aquarium is leading discussions about a plastic bag ban in Beaufort County; this would be the first county-level ban on plastic bags in the state of South Carolina. Various groups have joined forces with South Carolina Aquarium and recruited citizen scientists to participate in clean-up events and public hearings with city officials regarding plastic bag bans. These include Charleston Chapter of Surfrider and Outside Foundation of Hilton Head, South Carolina, and the Coastal Conservation League of South Carolina. Anecdata.org offers multiple options to citizens interested in engaging with their communities to address environmental problems. They can choose to contribute to a project that already exists, using instructions and protocols provided by the project manager, or take on the role of project manager and initiate a project of their own (Figure 2). As evident from the examples in this article, Anecdata projects can be built easily by any individual or organization interested in creating a project. After creating an account and logging in, project managers can develop a project page with an identifying logo and photo and provide a description, protocols, and links to additional information. The manager can then easily develop data sheets, choosing from existing data metrics or defining new ones. Project participants can be invited to join the project through the website or recruited in other ways such as press releases or social media. Participants do not have permission to edit the project page or datasheet, but can contribute information as instructed on the project page. In many online citizen science projects, participants upload data, but cannot retrieve or visualize data. 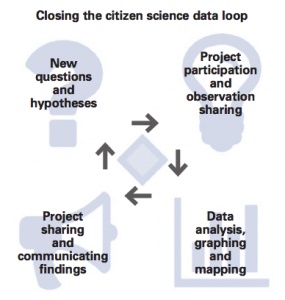 For these projects, the data are generally for use by scientists and not by citizens to effect change, leaving most citizens out of a significant portion of the citizen science data loop (Figure 3). With Anecdata, once data are contributed, anyone can download them as an excel file, thus closing the citizen science data loop by enabling interested persons to sort and analyze the data and communicate their findings. For members of the public who want a quick look at data relationships using graphs or who do not have the software or data-analysis skills to create their own graphs, we have created easy-to-use data-visualization tools. For researchers and skilled users performing offline spatial analysis, all data are available for download as ArcGIS shapefiles. Finally, for those who do not have ArcGIS software or do not have advanced mapmaking skills, all data are similarly available in Google Earth format, or can be viewed in a map on the Anecdata website. By making resulting datasets easily available to the public, in multiple accessible formats, we allow project participants to take the next steps in the citizen science data loop, visualizing trends and identifying anomalies and easily sharing their findings with municipal officials and other decision makers in their communities. The Community Lab is a model for other communities of how to foster a working relationship between students, teachers, and community members and engage them as citizen scientists in the process of understanding and addressing environmental problems. Through Community Lab projects and programs, people achieve a sense of ownership of, and responsibility for, local environments. Over the last two decades, the Community Lab has amassed extensive datasets, largely derived from citizen contributions. Anecdata.org is our solution for making data publicly available and for empowering citizens to take action on the data they have produced. By making Anecdata.org free and available for everyone, we hope to contribute to the landscape of opportunities available online for citizen science initiatives. By providing features that support data visualization and interpretation, we are facilitating the movement from knowledge to action. For organizations that do not have a physical space for engaging volunteers, Anecdata.org can become a virtual Community Lab, where their projects are managed and from which data are shared. Unlike a placebased location for citizen engagement, Anecdata.org allows project managers to expand the geographic range of projects, include a diversity of people from within that geographic range as contributing members, and accomplish projects that might not otherwise be possible. For individuals or groups who are ready to take a leadership role in their communities, Anecdata.org can become the tool that helps them achieve their environmental goals. We have learned that when people are engaged in the collection of baseline data about natural environments that are important to them and provided with the tools that enable them to close the citizen science data loop, they are empowered to take action on the information they have generated. Anecdata.org also provides an archival space for historic projects that can now be transferred to the public domain: Gale McCullough’s decades of seal observations are gradually becoming available to all who are interested. We anticipate that other historic data will be archived on Anecdata in the future. Anecdata has a growing collection of projects. We are currently working to connect with SciStarter.com so that people seeking projects in which to participate will find them on Anecdata.org. We are also creating a mobile phone app to make project access quicker and easier from the field and are adding new features such as video uploads to the Anecdata.org platform. The South Carolina Aquarium Citizen Science app already has predictive modeling technology, developed by our partners at Bigelow Laboratory. This allows project managers and contributors to visualize how their data, combined with other publicly available data, informs our understanding of emerging environmental scenarios. We plan to add predictive modeling to the feature set of Anecdata over time. Finally, we plan to build out communication tools that will enable project participants to communicate with each other both within and between projects, provide additional tools for citizen engagement for project managers and participants who are ready to translate their knowledge to action, and create a space for project managers to share case studies and results summaries from their projects. We anticipate that Anecdata will accommodate other types of projects besides environmental projects in the future. The Anecdata platform lends itself to public health, biomedical research, economics, and other types of data-collecting endeavors, some of which are currently being explored. We acknowledge the contributions of Jordan Bailey, Stacy Platt, Albert George, and Christi Hughes to the emergence and evolution of Anecdata. The project has been supported in part by the Alex C. Walker Foundation, Long Cove Foundation, Maine Technology Institute, and MDI Biological Laboratory. Bailey, Duncan, Jordan Bailey, George W. Kidder, and Jane E. Disney. 2014. A Citizen Science Approach to Mapping Eelgrass (Zostera marina L.) Loss in Maine. Bulletin, Mt. Desert Island Biological Laboratory 53. Miller-Rushing, Abraham, Richard Primack, and Rick Bonney. 2012. “The History of Public Participation in Ecological Research.” Frontiers in Ecology and the Environment 10:285–290. Jane E. Disney is a senior staff scientist, director of the Community Laboratory, and director of education at MDI Biological Laboratory in Bar Harbor, Maine. She engages citizens as scientists in a number of research and education projects that span environmental and public health boundaries. In addition, she leads eelgrass restoration research and restoration efforts in Maine. Duncan Bailey is systems developer at the MDI Biological Laboratory. He is the creator and development lead for Anecdata.org and an advocate for open data and the democratization of science. Ashley Taylor is a bay steward and data specialist at the Community Laboratory at MDI Biological Laboratory. Her present position involves data management, analysis, and support for a suite of research and citizen science projects, including conducting outreach.